(LWI) - One of every three girls in Uganda misses up to a week of school each month due to a lack of sanitary pads. LWF is working to reduce the stigma of menstruation and to support girls with proper hygiene materials. ”The monthly red tomato is here…” is the chant of boys at Belle primary school in Palorinya refugee settlement, Uganda, when they spot menstrual blood stains on a girls’ school uniform. This has become an embarrassing and stigmatizing monthly experience for many girls, Peace Julius Juru, a student in the sixth grade of primary school, says. Mary Grace Gala, the headmistress of Belle primary school, has observed incidents like these many times. 2,500 girls are enrolled in her school, the majority of them South Sudanese refugees. Many miss classes for at least three days every month because of their menstrual periods, a lack of sanitary items and the fear of “the bleeding shame”. Research by the organization “Build Africa” indicates that 29.7 percent of the adolescent girls in Uganda miss a minimum of four days per cycle during the 80 days allocated to a school term, and 24.3 percent of the female students said they had been stigmatized, so they had decided to stay at home until the end of the cycle. The trend threatens to reverse the success of increased school enrollment, as well as girl’s literacy levels, thus endangering the country’s progress on achieving the sustainable development goals (SDG) such as quality education, no poverty, gender equality, decent work and economic growth. I wrap a sweater around my backside whenever I am going to stand because I can never be sure that the rags haven’t leaked. “I wrap a sweater around my backside whenever I am going to stand because I can never be sure that the rags haven’t leaked,” she says, adding that she usually stays home on the first days of her cycle because this is not enough. To overcome the stigma for menstruating girls and to prevent female students from missing classes, the Lutheran World Federation (LWF) in partnership with the International Organization for Migration (IOM) provides free sanitary pads to girls in Palorinya settlement’s primary schools, and has started training women and girls on how to make reusable pads. Part of the campaign is also education of boys and girls about menstruation. “I received a free package from LWF in August,” said Juru. “I need one like these every month. They are comfortable, and I don’t have to fear stains and shaming,” her fellow student Menahal added. 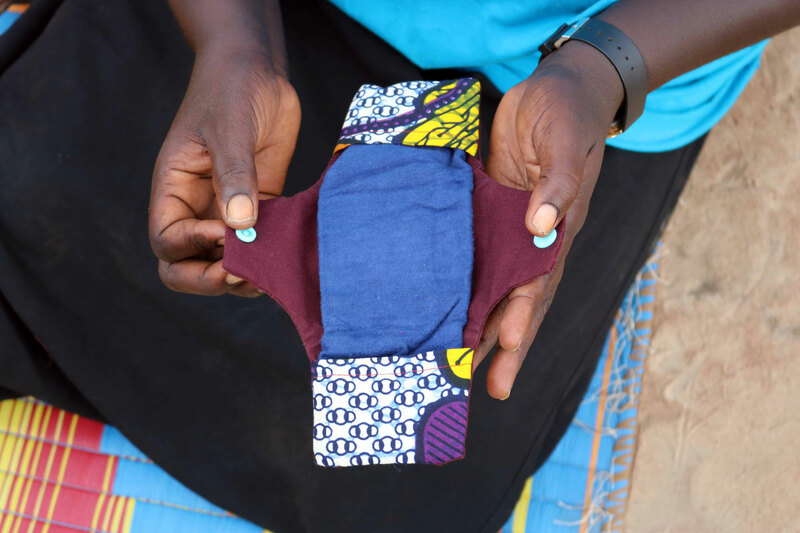 Nyamatte appeals to the government of Uganda to include sanitary pads as a basic need in resource allocation to refugees, or to support training for students to make safe reusable sanitary materials. The project is funded by the International Organization for Migration (IOM).